Hello again! It’s your friendly neighborhood Midwest Digital Marketing SEO Director Michael, coming to you from the land of the frozen tundra. MDM has recently started into our second year with a few larger SEO clients, and I’ve been challenged on new strategies for these clients. First off, let’s start with the obvious: the SEO, SEM and Social Media work we’ve performed for these clients in their first year is working for them. If this wasn’t the case, we wouldn’t have the opportunity to keep them as clients. Secondly, we come to a point where status quo isn’t going to be enough for them. In my last blog post, I talked about Integrated Digital Marketing, and they are seeing the benefits in that school of thinking. Lastly, as the SEO Director, it’s on me to strategize how to be better than status quo. Each of these clients is different, and requires unique marketing strategies, but they all have one thing in common: Content! We all know that 2013 was a big year of change in the SEO world. Multiple Google algorithm changes throughout the year continually changed the way we worked on our clients’ sites. The best way I describe this to our existing, and potential, clients is to remind them of why they have a website in the first place: to engage potential customers. I usually go on for a few minutes comparing older SEO tactics to our new strategies. Old SEO tactics optimized sites for search engine crawlers. Our new strategy optimizes sites for the end user, or a client’s potential customer. 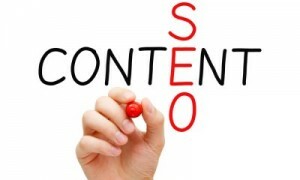 Content optimization isn’t anything new or ground breaking. Content is older than the internet itself…you have to provide something to a customer to keep them engaged with the product you want them to buy. However, we see a lot of websites lacking in quality content. Since I’m all about keywords, let me reinforce this – the keyword here is QUALITY! There has to be a reason visitors to your website stay long enough to discover what great products or services you have to offer. If you don’t regularly update your content, you’re basically telling visitors “move along, nothing NEW to see here”, and your bounce rate is through the roof. Late in 2013, I read an interesting article on keywords and how they affect online marketing. This article made a lot of sense to me as it talked about thinking topics, not keywords. It was at that point where I realized that “search engine” optimization has faded away and given birth to content optimization instead. I spend a lot of time asking clients what they want visitors to their site to do. How exactly do you want visitors to interact with your site and the products or services you offer? That’s the $64,000 question, right? This is my opportunity to take them by the hand and bring them into 2014 and discuss content optimization. This involves our content creators on staff sitting with my SEO professionals and generating website content that will engage and keep your customers. SEO is always changing…we are just making sure to stay ahead of the curve. Filed under: Content, Digital Marketing, SEO.